Aaaand, we’re back! Oh friends, it’s been too long! 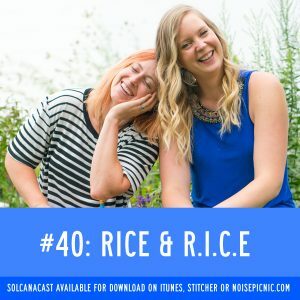 Join us as we talk all things rice (the food) and R.I.C.E (the technique). Neither are for everyone, and both can be used as individuals see fit. Catch new episodes of Solcanacast Mondays via noisepicnic.com, iTunes or Stitcher! And don’t forget to holler at us over on facebook with your questions, suggestions and ideas for where you want us to go next! MMMEEATTS: Movement, Mobility, Massage, Eating, Exercise, Alternatives to Anti-inflammatories/analgesics, Trainer, Therapy, Sleep.